Adding a fireplace onto your home can serve as a wise investment that keeps you warm this winter. Before you decide to add one on it’s important to consider what type of fireplace you want, where to install the fireplace and overall safety. Homeowner surveys reveal that the majority of homebuyers want a fireplace and are willing to pay extra for it. It is almost always possible to add a fireplace onto an existing home, especially with so many options ranging to include wood-burning masonry and wall-mounted ventless units. Chimney specifications, such as height, minimum clearances around vent pipes and construction of the flue and firebox, will vary depending upon local building codes. 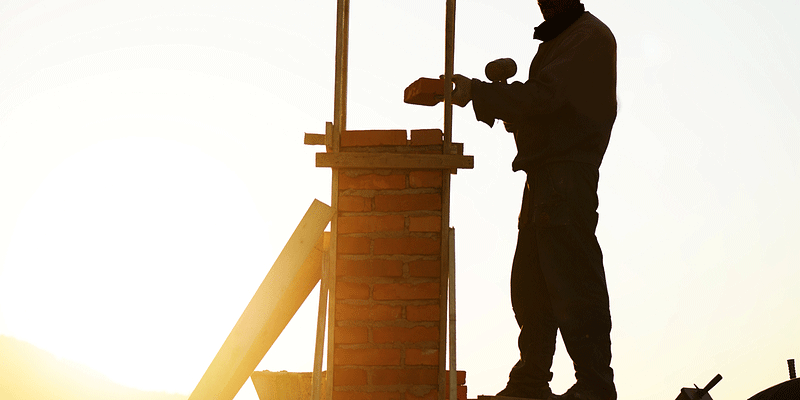 When Turnbull Masonry adds a chimney to your home you can rest assured that it is up to code, safe in every way and built to last over the long haul. Contact us today and we are happy to answer any of the questions you may have about adding a fireplace and chimney to your home. Here are answers to some of the most commonly asked questions we get about adding brick chimneys to existing homes. What are the most popular places to install a fireplace? Most people prefer to install a fireplace in a main living space, such as in the family room, living room or some other great room used for family gatherings and entertaining. While it won’t add as much resale value to your home, you could also add a fireplace to your bedroom, private seating area, an office or guest room. Another popular place to add a fireplace is outside in your backyard. Outdoor units typically cost the same as indoor units without the added efficiency. Outdoor fireplaces are more of a luxury addition to the overall ambiance. How do I know what type of fireplace to purchase? A professional can help you identify the most cost effective type of chimney and fireplace for your home. In general, your options include gas, pellet, wood, electric or bioethanol-burning fireplace. Wood-burning fireplaces are traditional, beautiful and reminiscent of the ‘good old days.’ You must have a chimney with a wood-burning stove. Most wood-burning stoves are accented by masonry elements in order to create that intimate and homey feel. Pellet stoves provide a more energy efficient option that resembles wood-burning fireplaces. Wood pellets burn clean and efficiently but pellets are sold in large heavy bags and don’t run cheap. Gas-burning fireplaces can be turned on with the flick of a switch as the ceramic logs light up. Cleaning is very easy with this type of fireplace because the burn chamber is sealed behind a piece of glass. Bioethanol fireplaces and electric fireplaces are other options that may be worth considering. Installation considerations vary based upon the type of fireplace you pick. Gas fireplace considerations include: gas line installation, assembly and customization, ventilation and wiring. Every type of fireplace requires the decision for vented or vent-free. Talk with a professional and make note of all considerations. It’s important to know the exact scope of the project before deciding if it’s the right choice for you or not. Traditional wood-burning fireplaces tend to hog up a lot of energy, but sealed units, even those that burn wood, are far more energy efficient. Sealed units are equipped with controls, mechanics and ventilation systems that rely on outdoor air for combustion and reduce thermal loss while efficiently supplementing your home’s main heating system. If you use a fireplace for small areas instead of a furnace or space heater you can reduce your energy bills. That’s because you can turn down your thermostat when the fireplace is on. Overall, installing a fireplace shouldn’t be based on saving money on energy costs. Instead, a fireplace adds value, appeal and comfort to your home. How safe is it to add a fireplace to your home? A new fireplace is only as safe as the construction is sound. Quality craftsmanship of the fireplace box, chimney and all the way up to the chimney crown is fundamental to keeping your home and family safe. If a chimney is incorrectly built your entire home could become unsuitable for occupation. In other words, this isn’t the type of project you want to DIY or hire cheap labor for. How much will it cost to add a fireplace to your home? The final dollar amount varies considerably depending on the complexities of adding a chimney to your particular home, materials used and the type and size of chimney you pick. Contact Turnbull Masonry for a competitive quote. Which is Stronger – Concrete Blocks or Conventional Bricks? Garage Floor Cracks – What Causes Them?